Lakers dominate the catch with Chinooks and Coho coming on strong. To get my fish reports and how to videos first go to http://www.jimhirt.com By subscribing you will keep ahead of the other anglers. When I post you will get it fast! 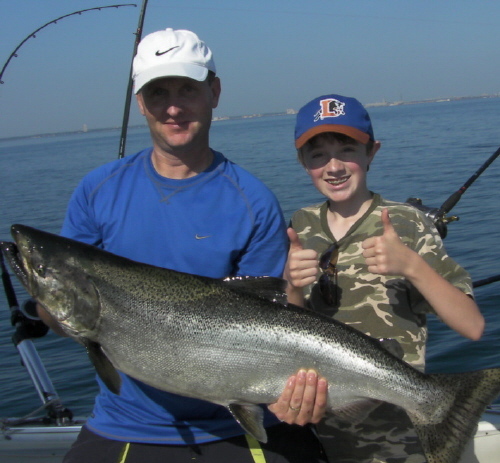 Gavin and Dale Proctor teamed up to crank in four hundred feet of line to land this 27 plus pound Chinook. Great job guys!! This fish was taken on a Vulcan Magnum Silver Lizard spoon. Coho are coming in 105 feet of water 55 down. Eight inch coyotes in green with Howie aqua flies have been the best with some action on small size spoons. Reapers and Vulcans made by http://www.badgertackle.com have been working for us. The small silver Vulcan has been working on the 300 copper. Coho are down as the water has warmed to 73 degrees on top. Water temperature varies from one area to another it pays to turn and go back over productive spots. Tie your flies 24.5 inches on 8 inch flashers. I hope this helps. Chinook are taking flies and also magnum spoons. Wire divers set to 1.5 with 100 feet of line out have been the most consistent. Chinook are coming in 105 feet of water 55 down. I use the Depth Raider to measure speed at the ball. The boat speed of 1.9 to 2.2 has been best. For Lake Trout magnum Reaper glow spoons presented within inches of the bottom will bring in some hogs with the most running 5-8 pounds. A size 0 dodger and Spin N Glow may be needed on some days. Fish are marking from 80 feet and all the way out north or south of Milwaukee to 140 feet. Have a great fishing season. Let’s go fishing! Lakers a plenty with some Coho and Chinook too. To get my fish reports and how to videos first go to http://www.jimhirt.com By subscribing you will keep ahead of the other anglers. When I post you will get it fast! 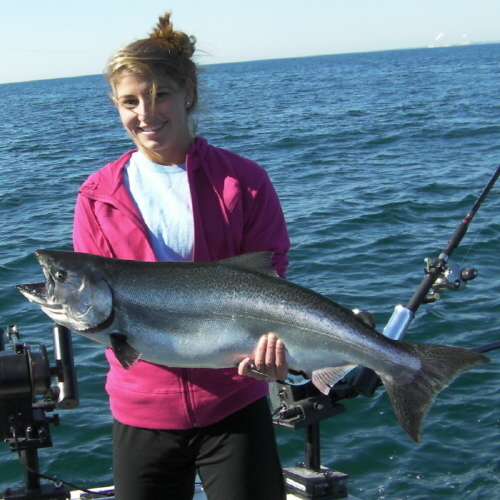 Alyssa Bryant brought her beautiful family out fishing and after a hard fight landed this 17 plus pound Chinook. Great job Alyssa!! Coho are coming in 105 feet of water 75 down. Eight inch coyotes in green with Howie aqua flies have been the best with some action on small size spoons. Reapers and Vulcans made by http://www.badgertackle.com have been working for us. The small silver Vulcan has been working on the 300 copper. Coho are down as the water has warmed to 66 degrees on top. Water temperature varies from one area to another it pays to turn and go back over productive spots. Tie your flies 24.5 inches on 8 inch flashers. I hope this helps. Chinook are taking flies and also magnum spoons. Wire divers set to 1.5 with 100 feet of line out have been the most consistent. Chinook are coming in 105 feet of water 55 down I use the Depth Raider to measure speed at the ball. The boat speed of 1.9 to 2.2 has been best.